For the first time in its 107-year history, Chivas Regal has moved out of blended Scotch whisky and into blended malt – and the reasons for the shift say much about the current state of the Scotch whisky market. Richard Woodard reports. It isn’t difficult to see a trend emerging here. Several months after Scotch whisky’s biggest producer, Diageo, relaunched its Johnnie Walker Green Label blended malt around the world, its nearest rival, Pernod Ricard-owned Chivas Brothers, has moved into the same segment with flagship blend Chivas Regal. Speaking on the day of the launch party for Chivas Regal Ultis in Cannes, Chivas boss Laurent Lacassagne highlights two reasons for the introduction of the new, US$200 expression: innovation and filling a gap in the range. ‘We had the desire to have a luxury offering sitting somewhere between Chivas 18-year-old and 25-year-old,’ he tells me, and it’s true that the price gap between the two products is rather gaping: well over £100 in the UK. But why a blended malt and not a 21-year-old blend, for example? 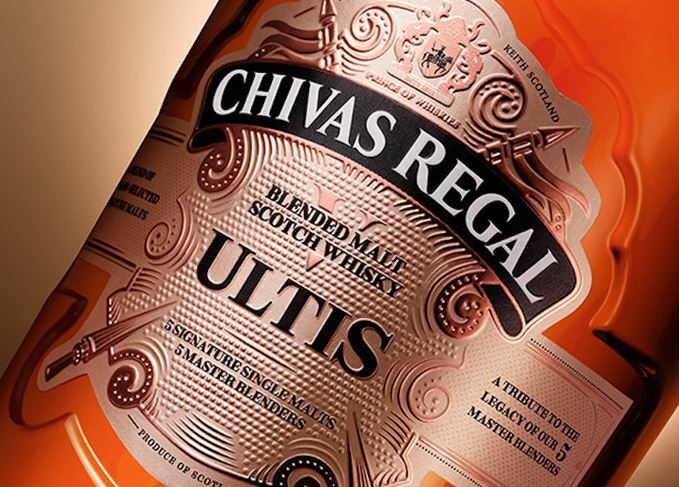 Hence Ultis, a whisky for which the number five is central: a tribute to the five master blenders who have looked after Chivas Regal since its inception in 1909, and made up of – to quote Lacassagne – ‘five iconic malts with which Chivas has been made over the years’. On this last point, it rather depends on how you define ‘over the years’. Of the five malts in question – Strathisla, Allt A’Bhainne, Braeval, Tormore and Longmorn – Strathisla has been in Chivas’ hands for longest (since 1950). Allt A’Bhainne and Braeval were only built in the 1970s, Longmorn was acquired in 1977, and Tormore followed in 2005. Anyway, blended Scotch whisky brands rarely stand still, either in terms of the liquid used or the way in which it is classified. Chivas Regal, after all, started life as a 25-year-old, before circumstances dictated a downgrading to 12-year-old. Further expressions – including an 18-year-old and the return of a 25 – have been relatively recent additions. There’s also no doubt that product innovation is as important to blends as it is to the single malts which – in terms of publicity, at least – tend to overshadow them these days. ‘We have already made a few moves out of the traditional range,’ points out Lacassagne. ‘We launched Chivas Regal Extra [in 2015], the first non-age statement [NAS] whisky within the Chivas range.’ And, he adds, it’s been a success, selling 100,000 cases a year at the latest count. The launch of Ultis is a global one, but the Cannes location is far from accidental. This week, the Riviera resort hosts the annual TFWA travel retail trade exhibition – an important sales channel for Chivas Regal, and one where shoppers are traditionally on the hunt for something new to take home from their travels. That said, the roll-out over the coming weeks is also focused on all the traditional luxury hotspots: Asia, the US, the Gulf. India – where increasingly wealthy consumers are beginning to disregard the cripplingly high levels of excise duty – is one key market; China – where Lacassagne says Chivas ‘created’ the modern market for Scotch, but where it has since suffered a serious downturn – is another. The logic of Chivas Regal having a product sitting at the US$200/€170 price point, and filling that pricing gap, is irrefutable, but the reasons for that product being a blended malt take a little more teasing out. Again, this is logical and says much about current trends in Scotch whisky: the rise of single malts and the relative decline of blends. Just look at the way in which the same company, Chivas Brothers, publicised the recent launch of Royal Salute 32 Year Old Union of the Crowns, a luxury blend: by talking up the individual single malts that go into it, from Braeval, Longmorn and Tormore again, to closed distilleries Lochside and Caperdonich. If you can’t beat them, join them: promote the single malt components of your blend or, as with Ultis, make your blend into a malt altogether. And maybe – just maybe – by doing so you’ll persuade some single malt snobs that blends aren’t so bad after all. A new release from Martell in the US says much about the rise and rise of single malt Scotch.